The newest addition to our collection, our locally-harvested black walnut boards are the perfect union of craftsmanship and modern design. Crafted in Beacon, NY with regional wood, these boards are handmade and therefore no two are alike. Notice the slight variations in their color and grain pattern, adding to their uniqueness and beauty. Available in three modular sizes, these versatile boards can be used as a cutting surface, or as an inviting centerpiece. 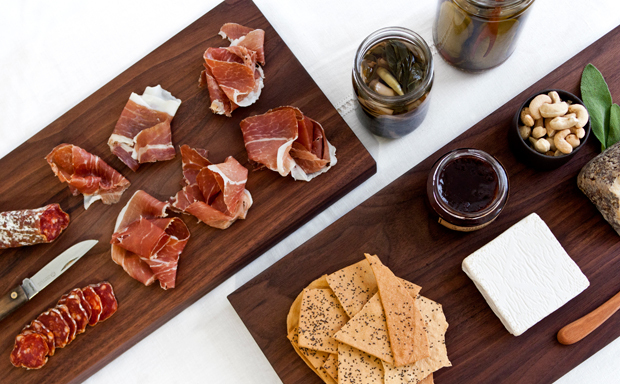 Use them for serving sandwiches, arranging charcuterie, or as a stunning cheese platter. The small size is also a great way to optimize limited space for urban dwellers. A small routed edge on the bottom of the boards gives the appearance that they are floating, creating an elegant and seamless effect. Perhaps best of all, these boards are low-maintenance, requiring only a wet sponge and a light coating of oil. We recommend Black Creek Mercantile oil.